Why are There Blood Spots in my Fresh Eggs? If you raise your own chickens or buy eggs from a local farm or farmers market, this has probably happened to you on occasion. 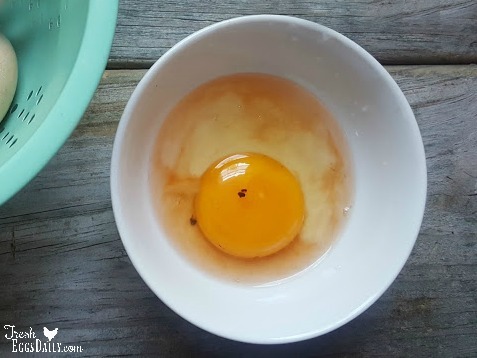 You crack an egg into the frying pan and notice a bright red blood (or meat) spot on the yolk. You might have assumed that meant the egg was fertile (not true) or that the egg isn't edible (also not true). At the very least, it's a bit off-putting. It's a topic that comes up often as new chicken keepers' spring chicks start laying eggs. But in a nutshell (or should I say "eggshell").....A blood spot in an egg is harmless. It's not an indication that the egg is fertile, but instead it's merely caused by a small rupture in a blood vessel of the hen as she was laying the egg. If the blood spot is on the egg yolk, the rupture likely occurred in the ovary. If the spot is in the egg white or there are streaks of blood in the white, then the rupture occurred on the oviduct. Laying eggs with blood spots can be genetic, or can be age or overall health-related, although spots often occur if the hen is startled or stressed while she's laying. Stress factors such as not enough water, low-quality or moldy feed, inadequate housing or shelter, or sudden loud noises can all affect egg quality, as can a Vitamin K deficiency. In extremely rare cases, frequent blood spots in eggs can indicate Avian encephalomyelitis. It's also thought that blood spots will occur more frequently in eggs laid by chickens living in coops that are supplemented day and night with artificial light to force them to lay, which doesn't provide them enough darkness to produce the levels of melatonin they need. It's estimated that blood spots occur in a small percentage of eggs, roughly 3%, but rarely show up in a carton of store bought eggs because the eggs are candled (ie, a bright light is shined through the shell to detect them) and those eggs containing blood spots are discarded or used for animal feed. However, brown eggs are more likely to contain blood spots which poses a bit of a problem for commercial egg farms because a brown shell is harder to see through. 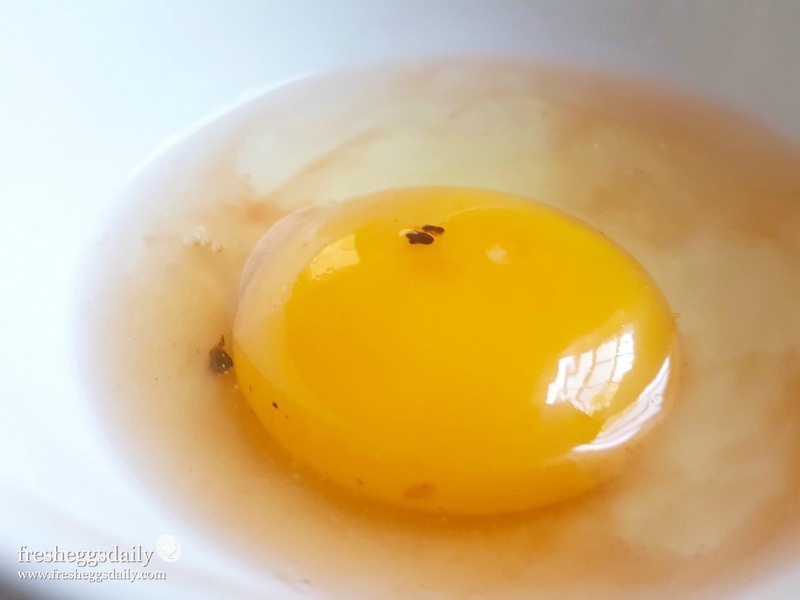 An egg with a blood spot in it is perfectly safe to eat, but if you wish you can fish the blood spot out with a tip of a knife or the tine of a fork. Generally, blood in chicken eggs is not anything to be concerned about.